Arbitral proceedings between host states and foreign investors show no sign of abating. Of 419 total cases registered by the International Centre for Settlement of Investment Disputes or ICSID (the main arbitral body administering investor-state arbitrations since 1972), 50 were registered in 2012. This exceeds the prior record years’ for new case activity by about a third. According to some accounts, the claim value of investor-state disputes nears the GDP of Switzerland. In all of these new cases, it would be unthinkable to argue a point without reference to earlier awards and decisions. One reason to study arbitral decisions, therefore, is to be an effective advocate in investor-state proceedings. For the more academically minded, studying investor-state decisions (and their reliance on prior decisions) will permit one to understand the rules of decisions employed by investor-state tribunals. A systematic collection of investor-state decisions is an inevitable tool to act within and speak about a burgeoning field of international law. Angel Gurría, OECD Secretary-General, gives the opening speech at the Global Angel Gurría, OECD Secretary-General, gives the opening speech at the Global Forum VIII on International Investment. 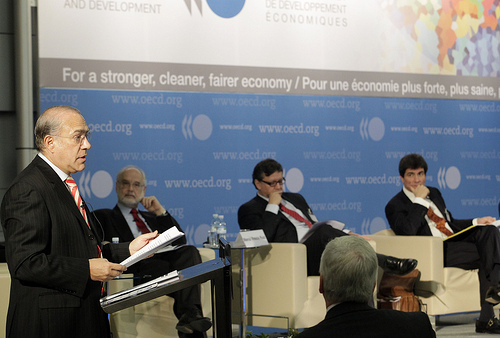 Photo by Hervé Cortinat/OECD, CC BY 2.1, via Flickr. This pragmatic answer is superficial. Some commentators have warned that tribunals frequently come to facially inconsistent decisions. It can lead one to opine that this inconsistency threatens the predictable application of investment protection treaties. Such an opinion would focus almost exclusively on the result reached by investor-state tribunals. Rather than understanding decisions as an organic outgrowth of the dispute resolution process — the record and arguments presented by the parties — one would exclusively read and rely upon decontextualized snippets of holdings and treat them like the aphoristic disembodied wisdom of a distant sage. In truth, investor-state arbitral decisions have relevance for an entirely different reason. For instance, the body of jurisdictional decisions by investor-state tribunals perfectly exemplifies the process and principle of access to justice at international law. The International Court of Justice developed a balancing test that “there is no burden of proof to be discharged in the matter of jurisdiction” but that a tribunal instead must determine from the record “whether the force of the arguments militating in favour of jurisdiction is preponderant.” This process gives pride of place to the context of decision — the record and the submission of the parties ignored by the superficial engagement of investor-state decisions. It also captures the international law principle of access to justice. It bridges the competing considerations that (a) exercising of jurisdiction is the sole means of access to justice against the respondent state and (b) that the respondent has limited its submission to international jurisdiction by the terms of the consent instrument. Digesting investor-state jurisdictional decisions in their entirety (including the arguments presented by the parties) provides a systemic map of the uniquely complex international law process of jurisdictional decision as actually applied. Investor-state awards similarly transcend a shallow exercise in quotation and glossing the holding of particular cases. They are building blocks of a coalescing international common law, grown from an evolving understanding of common problems, such as the meaning of a certain non-precluded measures clause in a US bilateral investment treaty. Internationa law did not develop around pithy quotes lifted from earlier awards. The parties provide alternative accounts and different potential solutions in each new case involving the same language to be interpreted (for instance, the WTO interpretation of said non-precluded measures clause was only pled by Argentina one of the latest proceedings). None of these solutions is ever final. Rather, investor-state awards provide hypotheses to be tested by different, rival considerations not previously expressed. This process of problem solving is relevant beyond investor-state arbitration in any international legal proceeding. A principled approach is needed to navigate the complex maze of international law decisions. Studying international arbitral decisions provides key insights into international law by unveiling how it operates. Frédéric G. Sourgens is an Associate Professor of Law at Washburn University School of Law. He is a contributor to Investment Claims, an online law resource from Oxford University Press. Investment Claims is a regularly updated collection of materials and analysis used for research in international investment law and arbitration. Described as an invaluable resource by its users, Investment Claims contains fully searchable arbitration awards and decisions, bilateral investment treaties, multilateral treaties, journal articles, monographs, arbitration laws, and much more, all linked and cross-referenced via the Oxford Law Citator.